This is what results from 50 years of walking with a ruptured medial collateral ligament in your left knee--gross deformity of one's body plus excruciating pain in the opposite knee and the arms that are trying to compensate for the load that the injured leg cannot bear. This poor woman, who is now in her eighties, has dragged herself around for fifty years like this. She used to walk with crutches, but had to give them up as she kept falling down. Most recently, she walked supporting much of her weight with her hands pressing down on a plastic stool. 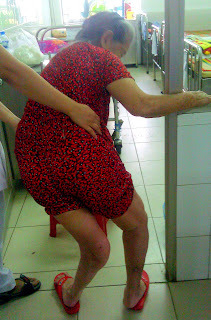 When even that was becoming impossible due to the worsening arthritis in her "good" knee and in her arms, she came to the Traditional Medicine Hospital of Da Nang in a desperate quest for help. At this point, her entire body appeared twisted from the decades of maladaptive ambulation to which she had been reduced. There was no quick fix available for her. And so we did two things: first we assigned Vu, a young Vietnamese therapist who had recently completed a course in Myofascial Release therapy conducted by Joni and Roger Edmonds at our hospital, to help stretch out her tortured body so that she could sit and stand erect. Then we asked Mr. Anh, a local orthotic technician, to fabricate a custom brace for her that would stabilize her injured knee so that she could bear weight upon it. And now, Vu and Hien, two of the young therapists that I have been training for the past two years, are working with this elderly woman in order to help her regain her ability to walk on two feet, with the support of her new brace and a walking frame. What was the cost to Steady Footsteps, our organization? One hundred US dollars for the custom brace and the sandals to go with it. That works out to two dollars a year for fifty years of suffering. There's a message in there, somewhere.